Former Presidential candidate and publisher of Ovation magazine, Chief Dele Momodu, has cautioned President Muhammadu Buhari against taking Nigeria back to the days of oppression and suppression. According to him, President Buhari’s alleged attempt to use of security operatives and some senators of the All Progressives Congress, APC, to sack the Senate President, Bukola Saraki, and other heavyweight politicians for dumping the party was a fight that would prove too costly for him and the country. 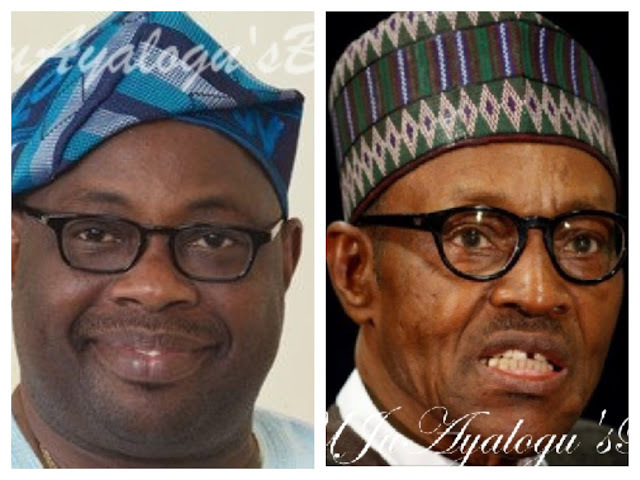 In an open letter to the President titled: ‘Dear President, let your people go’ which was released on Sunday, Momodu reminded Buhari that his victory at the 2015 election was through the combined efforts of his most loyal supporters and those from the defectors including the Senate President. “Your Excellency, it is with every sense of love and patriotism that I have decided to write you again despite the frustration of knowing that you may not hearken to my sincere advice to you, as I have written to plead with you on several occasions, but my entreaties have been to no avail. I pray this letter meets you well in the beautiful city of London where I expect you to be resting and relaxing by now whilst waiting to undergo your mandatory physical check-up. “Before I go on, please, permit me, Sir, to take you down memory lane, from the First Republic to the present. Practically all our leaders failed, or fell, usually not because of only what they did wrong but ostensibly because of what they did not do right. Let me also establish one fact. Most of our leaders have been catapulted to power, not by their superlative might, but by divine intervention. One day, I will chronicle how providence has been responsible for the exalted position all our leaders found themselves. Sadly, practically almost all of them forgot how they reached their lofty heights and sought to personally perpetuate themselves in power, but the celestial manner of their enthronement also saw to their humiliating, sometimes tragic, downfall. Consequently, virtually all, except may be General Abdulsalami Abubakar, were disgraced, removed or retired ignominiously or controversially. “President Obasanjo who was easily the most efficient, efficacious and effervescent leader, after the brilliant and youthful General Yakubu Gowon, ended his tenure in 2007 with the reverberating hoopla surrounding his third term bid. Whether he was interested in it, or his acolytes forced him into it, all his good works would always attract that cloudy addendum. It is noteworthy, for emphasis, that no leader in Nigerian history has ever succeeded in enslaving Nigerians. We can stretch this further, by stating categorically, that no leader in the world has ever achieved absolute authority permanently. Indeed, that is a preserve meant only for God. If only humans reminded themselves constantly of this fact and their mortality! “This is the reason I wish to appeal to you once again to resist the temptation of wanting to take Nigeria back to those days of oppression and suppression. In case you need to be reminded of how much God loves you, I shall gladly oblige. When your military regime was toppled in 1985, your enemies danced on the streets. You were compared to the worst dictators on earth and many would have thought it was finished and over for you. But the ways of the Almighty are not the ways of man. 30 years later, the same Nigerians who rejoiced over the collapse of your military junta, in their collective wisdom or stupidity or amnesia, gave you a resounding victory at the polls against a powerful government and incumbent President. This was after you had tried for a record third time and had virtually given up any chance or hope of winning a Presidential election again. You had actually wept for Nigeria and yourself on that third inauspicious occasion. “What more could anyone ever ask for again in this life? Credit for that victory must go to everyone, including saints and sinners, in case such nomenclatures exist on planet earth. Please, let no one rewrite the history of that epic battle to dislodge the PDP behemoth. It was thus a gross miscalculation to get power by such default and try to change the narrative by saying you belonged to everyone and to no one, or whichever way it was crafted by your speechwriters. Truth is you belonged to the party that embraced you, warts and all, and all the foot-soldiers who made it possible for you to attain power once again. Not just that, you instantly became the father of the nation on that fateful May 29, 2015, and could no longer discriminate against anyone for that matter. If you wanted to govern in peace and make an appreciable impact, you should have treaded softly and walked gingerly towards your ultimate destination. “The war of attrition that broke out as soon as you took power was totally unnecessary and uncalled for. Except for your most loyal supporters, not many ever trusted the many fisticuffs were to the benefits of Nigeria, but only for the pecuniary gains of the privileged ones in power. “If you fight a war for over three years and you are unable to defeat your enemies, you should realise that it is either they are stronger than you or your strategy is abysmally faulty and failing. I love the Yoruba adage: “ta a ba leni, ta a ba bani, iwon la a bani sota mo…” (If we pursue an adversary and cannot catch up with him, it is better to retreat, than continue to make enemies of such a person). It is not an act of cowardice to retreat or even surrender. The fight you are pursuing right now would eventually prove too costly for you and for Nigeria, even if you manage to win it, which I seriously doubt. By the time you reach the end of it, you will discover the meaning of anti-climax. The victory will be a pyrrhic one or if otherwise, a cataclysmic defeat. Therefore, I’m shocked that you’re allowing some reckless and vengeful politicians to goad you on and mislead you into victimising those who have left your party and are now opposing you. The same people you met and laughed with recently, before our very eyes, have suddenly become enemies who must be destroyed by all means. Sir, this act is totally unfortunate. Only God can give power and only HE can take it back. You did not use force to take power in 2015, why do you then think you need to retain that power by use of force and fire? “I’m not sure if you are familiar with world history, my dear President. You may need to ask your aides to print out some dark moments in human history for your perusal. What often happens is that you will, inadvertently, turn those you’re harassing now into superstars. What you are playing with is a game of David and Goliath. It is one of the most fascinating scenes in the Christian Bible. Goliath was so confident of his awesome strength and stamina and so looked down on pitiable and diminutive David. The Holy Bible recalls their fight was a classic example of a mismatch. But Goliath suffered a crushing defeat in the hands of David. That battle is still celebrated worldwide till today, and it is a story almost every child knows and is taught to learn from. “Those who have decamped from APC have only exercised their fundamental rights. Whether they are morally right is neither here nor there and is ultimately a verdict for the electorate to ponder and unravel when elections, which loom large, finally arrive. Similarly, whether they are legally justified in their defection is a matter which your party may seek to take up in the courts, and I am certain that the Courts will do justice to the case as they have been doing despite terrorisation, bullying and coercion from some over-exuberant agencies of your government. I pause to observe that some of these guys were hailed by us when they joined our side the last time. At that time, we justified their defection to us as being part of the democratic process. If they have now decided to go because they believe they are not wanted by some influential gladiators in the ruling party, my dear President, please let them go. Your party’s point that they have done so for less than altruistic reasons will be considered and digested by our people who are quite politically savvy and discerning. They will make up their minds as to the rights and wrongs of it all. “Your Excellency, I want you to remember that you will not be in power forever. You have your family and friends to consider. Those who have been locked up in prison today and those being hounded could never have envisaged a day like this would ever come when there would be a reversal of power and fortune. It is too cheap for a Governor to decamp today, and then he and his operatives are being terrorised tomorrow. Power should never be abused in this manner. Who knows what would happen when tomorrow comes again? “One of the reasons former President Jonathan is respected today and enjoys some peace is because he gave you great respect though both of you fought tooth and nail over power. He tolerated many of us who supported you and did not make the occupation of Aso Rock a matter of life and death. Sir, why can’t you reciprocate this wonderful gesture? It is to his eternal credit that, in the midst of our attacks on him, I got invited to the wedding of his daughter, and was treated with decorum. Politics should never be a matter of brutish animosity. That is why I always have tremendous regard for lawyers. They may fight like savage adversaries in Court but, whilst they are there, they still show themselves some honour and respect. It is their attitude once they step outside the courtroom that is even more remarkable. Then they shed the toga of adversaries and become noble and learned friends. I wish all of us could imbibe this kind of camaraderie in the practice of our political beliefs. “Furthermore, I have copious examples that show that what you sow is what you reap. I wish to plead with you to cool temper, Sir. I know how it feels to be abandoned in the lurch by your own friends and supporters. But that is life. Everything can’t be smooth all the time. When you go to the FIFA World Cup, you do so knowing only one team can grab the much-coveted trophy. You should try to play a good and clean game and leave the rest to Allah. You have played your part to the best of your abilities and should be happy once your conscience is clear that there was no better way to do things. “Even if you decide to keep all your opponents in the gulag, it still does not guarantee that you will win the next election in 2019. But if you do it in God’s way by embracing decency and fairness, your rating will go higher. You will attract natural admiration. The love of the people cannot be forced. You’ve been drawing sympathies to the decampees because of the high-handedness and intolerance of some of your agents. As I started this mail, what kept coming back to me was a very popular autobiography I read as a youth, LET MY PEOPLE GO, written by Albert John Luthuli, the very first Black African man to receive the Nobel Peace Prize. Luthuli led the African National Congress in South Africa in the apartheid years for 15 agonising years and coordinated mass resistance and non-violent crusade against the White supremacists. Though he did not live long enough to see the end of apartheid, others carried on the task and Nelson Mandela, who spent 27 years in prison, came back alive to become the first President of an independent and free South Africa. Mr President, there is a moralistic lesson to learn from the life and trajectory of the great Madiba Nelson Mandela. He became a world Statesman for his uncommon magnanimity and spirit of forgiveness. He had the power to exterminate his former tormentors and jailers but instead he decided to set up a Truth and Reconciliation Committee that tried to integrate the whites into a new black-dominated government. Nigeria needs urgent reconciliation, healing and unification, which has led to a strident clamouring for restructuring. We should be tired of fighting for power for personal aggrandisement after groping in darkness for 58 ugly years. There are no prizes for war but there are beautiful garlands for peace.